Virtual Reality is now the most advanced technology we have for entertainment and gaming. Allowing us to dive into a world we could have only imagined. 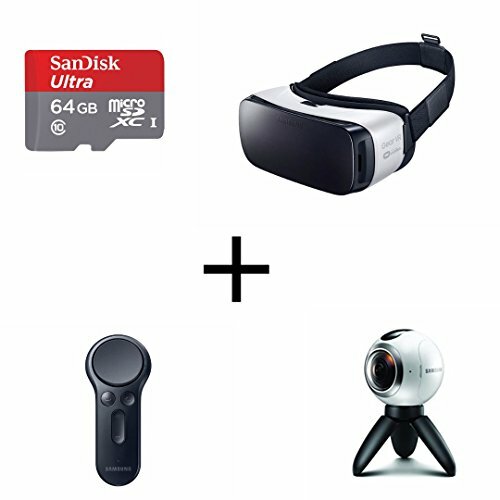 With thousands of ways to use VR, it's the perfect gift and purchase for anyone! Play amazing games, watch every movie you can think of in your own private cinema, connect online with friends and much more. Samsung Gear VR is the best virtual-reality gadget you can buy right now, and a great way to jump into the world of VR gaming and entertainment The headset converts Samsung's latest Galaxy smartphones into a full-on mobile VR headset. It's the third model and feels ready for prime time, with a great batch of games and apps to choose from. Each of them effectively transports you to a variety of 3D landscapes, letting you explore your surroundings by tilting and shaking your head, or totally spinning around without fear of leaving the screen. Netflix is among the first of the video apps available on the platform. The wealth of 360-degree video content that's available makes better use of virtual reality. Samsung Gear 360 Real 360 High-Resolution VR Camera From the band, the surrounding stadium and the crowd pulsing with electricity at a concert to your kids on the swings, flying kites and blowing monster bubbles at the park-with the Samsung Gear 360, you capture every angle all at once. The perfect addition in this all in one package! This is the perfect holiday gift for anyone, young or old. It brings to life an experience to be enjoyed by everyone! SAMSUNG 360 CAMERA . With the Gear 360, you'll catch life's every detail-whether you're shooting near 4K resolution 1 videos or a 30 MP photo. The bright F2.0 lenses capture clear, vivid content all day, even in low light, from your morning hike to your night on the town. SAMSUNG VR HEADSET . 360 visibility angles, head-tracking and low latency brings virtual reality to a whole new level Its premium virtual reality experience with a wide 101° field of view. Stream over 1 million short films and videos on Vimeo. Keep up with the best gamers in Twitch and enjoy amazing new videos daily on Samsung Milk VR. Games and applications available from the Oculus VR app store. VR CONTROLLER. Improved lightweight touchpad easy to use buttons let you dive straight into the action of your favorite game and start throwing, steering and aiming with the new incredibly responsive handheld controller. A back-trigger makes menu selection easy and FPS more realistic. SD CARD INCLUDED. While you may not need a MicroSD card, it's a worthy add on. No need to look around for a pre existing one, or order one separately with extra shipping charges. This is an all in one package that is straight to play. Fits into every computer and laptop and takes minutes to use.